ORANGE 1 in. 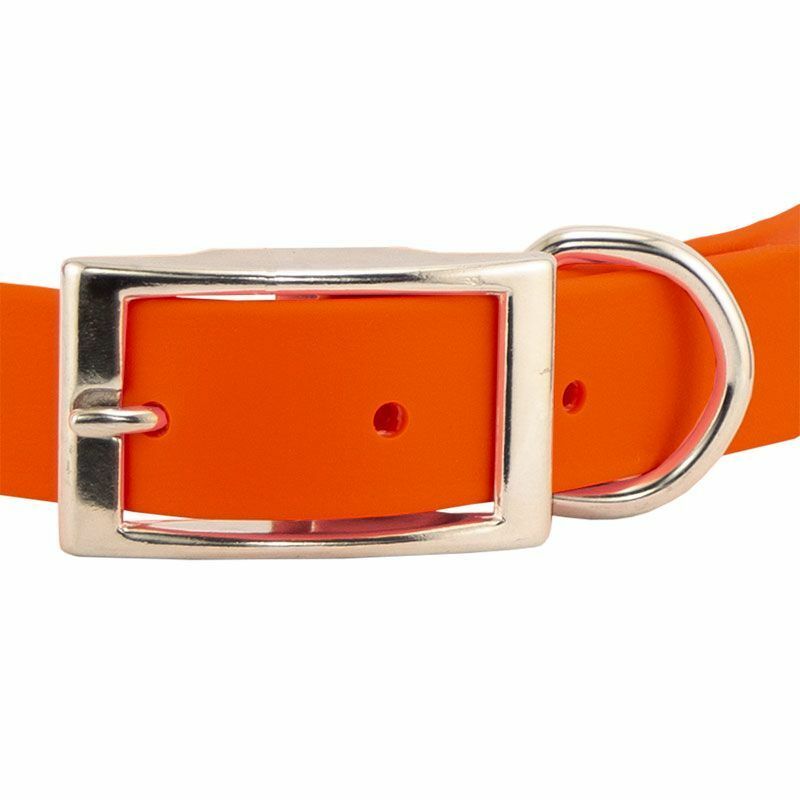 Mendota DuraSoft Hunt Dog Center-Ring Collar . $16.99. "I bought this collar on a Friday with standard shipping, it shipped the same day, and it's scheduled to be here already on Monday." I am always impressed with my experience buying with Gun Dog Supply... I bought this collar on a Friday with standard shipping, it shipped the same day, and it's scheduled to be here already on Monday. I've never seen such immediate attention from any other retailer on the internet today! Can't wait to get home and try out the collar. This is the second collar I purchased from them (first was a leather one), and the last experience was the exact same. In fact, my dog somehow lost the brass tag on a mountain trip, and they offered to send me a replacement for it at no cost! These guys are great! I've only had these for two weeks, but right now I would say they are the best collars EVER! I love the material. Soft, durable and absorb absolutely NO water. I love center ring designs. They allow me to hook my lead to the rear-end of the center ring. This way if my dog (the smart one) tries to back-out of his collar it twists in such a way that it tightens around his head - preventing escape. The engraved brass plate on the collar gives me some peace of mind, seems sturdy yet doesn't affect the performance of the collar, and looks darn good too! Great product and definitely not my last purchase from Gun Dog Supply! Size runs larger than depicted. "These are the best collars ever." These are the best collars ever. They are very strong, well made, and they last for years! I hope they are never discontinued. Great collars!! Not first time I have purchased. Great collar. Very durable for my hard working labs. "Best hunting collar I have bought." Best hunting collar I have bought. "The collar is perfect, high quality, fits just right, and the color is great for safety." 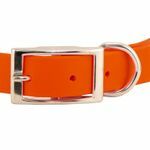 The collar is perfect, high quality, fits just right, and the color is great for safety. I also especially appreciated Gun Dog Supply's customer service and speedy delivery! "The four line ID tag is wonderful!" The four line ID tag is wonderful! The sizing info on your website was accurate. Collar is very bright, making it easy to see the dog in the field. "I buy all my collars through Gun Dog Supply because of the durability, price and quite frankly they always fit my dogs perfectly." I buy all my collars through Gun Dog Supply because of the durability, price and quite frankly they always fit my dogs perfectly. Good quality product overall. Latches and brass tag both appear to be of excellent quality. "Extremely satisfied with the quality and promptness." Extremely satisfied with the quality and promptness. Great collar. Durable and does not smell. I am very impressed. Quality looks great, and it's nice and bright hunter orange. It's everything as advertised and my lab, Angus, knows when I put it on him, good things are about to happen! Terrific product. High quality. Fits well. Brass plate is easy to read. Would shop here again and recommend this collar to friends. "I buy these for all of my dogs, all of my friends dogs, and will continue to buy these as long as they keep making them. " I buy these for all of my dogs, all of my friends dogs, and will continue to buy these as long as they keep making them. They are very durable for playing dogs. Can handle some medium chewing, and are strong and secure. The brass name plates are a very classy touch. I LOVE THESE COLLARS. Best collar ever! Durable and easy to clean. Have used these collars for 12 years on my current hunting dog (now retired), and for years before on my previous dog. They last forever and will roll on the dog's neck if he/she gets caught in branches or fencing. The only reason I ordered another one was an address change. Highly recommend. Perfect. Exactly as I ordered and as usual fast delivery!! Collar looks great, and I love the brass information plates that GDS puts on them. I bought an extra just to keep in my field bag. Great durable collars. Good price and good performance. My hunting dog has been wearing this collar for over a year, and it still looks new. "I highly recommend these collars." I bought these for my boys to wear during pheasant hunting. These are the 2nd set of collars I've bought from GDS. The only reason I bought a new set is due to the color. My previous ones are leather, and they are still as good as new. I highly recommend these collars. Excellent collar. Highly recommend the orange color. Fast shipping as usual. Thank you! "It's a good piece of gear at a good price." I can't think of anything negative to say about this collar. It's a good piece of gear at a good price. I really like the ID plate option you get with it. Your customer service and timely delivery is why I keep coming back. Awesome collar, 2nd one I have bought. First collar lasted 6 years on a hard running dog. Shipping was fairly quick, even to Canada. We love this collar. With hunting season going in full swing, Molly can be seen easily with the bright orange. The nameplate is an added bonus. Great collar for a great price. The collar is very satisfactory; the material is soft and pliable, and I think is comfortable for my dog, as well as durable. "Very good collar for hunting." Very good collar for hunting. Great collars. Shipped quick with the custom tags I had made and attached. Has a good feel. Sits well on the dog's neck. We use this collar for our dog, Emma, when we visit our 40 acres in the country. It ensures maximum visibility and takes punishment well (swimming, wrestling with neighbor dogs, rolling in grass/mud). GREAT Product! Excellent pliable plastic. Engraved tag is secured, riveted to collar. Bright orange easily seen and gets positive comments from passersby. Love this collar. Very sharp looking against his shiny black coat, and easy to clean. "Fits well and easy to use collar!" Fits well and easy to use collar! Solid fabrication with great material! Excellent service. Nice. More flexible than old woven ring collar. "The name tag is securely fastened and the color is waterproof, it's exactly what I wanted and I wish I had discovered it sooner." Soft and supple material. The name tag is securely fastened and the color is waterproof, it's exactly what I wanted and I wish I had discovered it sooner. The price is amazing also, I spent more than that on just an ID tag for my dog which he promptly lost the next day after running through the woods. "2nd time purchasing this product and first collars lasted about 10-11 years." 2nd time purchasing this product and first collars lasted about 10-11 years. 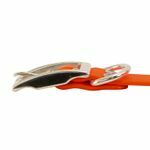 "Great collar for the field, soft, durable and made her easy to spot in brush." Had one on my beloved Bella before her passing. Great collar for the field, soft, durable and made her easy to spot in brush. Great collar. Fits very nicely. Great company! This is our second durasoft collar. The first started to show small cracks after 4 1/2 years, so we replaced it with a new one. Excellent product. Cleans easily, dog seems to like it, and it's safe. I like the D-ring for a leash. GDS's name plate was also excellent. It was 100% legible and affixed after 4 1/2 years. Looks great on an all black dog! "It is easy to spot her in the field." Second purchase. Love the bright orange with her color being Brindle. It is easy to spot her in the field. Great collar. Very soft and strong. I am using it with an extremely strong GSP, and he cannot break it. "Last one lasted 2 years before fading/tearing." Last one lasted 2 years before fading/tearing. I'll buy another when this one is wore out!!! "Pleased with the material. Much better than nylon." Pleased with the material. Much better than nylon. Don't have to worry with the smell when it dries after the dog gets in water. Good heavy collar. 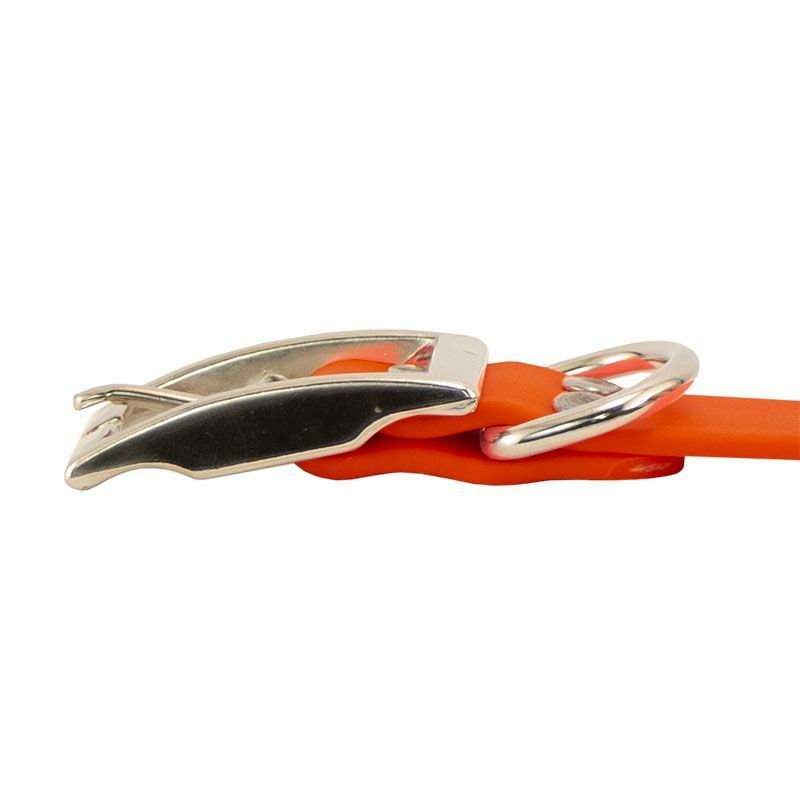 Has good fastener and can be hooked to leash in 2 places. Excellent collar! Fits perfect. He has 16 inch neck. I got the 16 inch to 20 inch. He is on the smallest hole. The engravings came out perfect. The collar is strong and should last a long time. Great collar all around. It doesn't wear out, and it has great visibility! Great collar. Bright. Solid. Well built. Only collar I will use for my GSP. We love these collars. They are comfortable for the dogs and work well since the dogs are in the lake a lot. 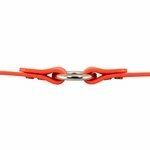 "These are the best collars I have ever used. " These are the best collars I have ever used. They wash easily, don't absorb odors, and are very durable. The bright orange color makes my black dogs easy to spot, even at night. "Same as filson for 1/2 the money with a custom tag." Same as filson for 1/2 the money with a custom tag. "I only use Gun Dog Supply for my 2 GSPs hunting gear needs!" The BEST collar out there at a great price and excellent customer service. I only use Gun Dog Supply for my 2 GSPs hunting gear needs! "This is my hound dog's don't shoot me collar - her second one." This is my hound dog's don't shoot me collar - her second one. Her brown coat makes her look like a deer in the woods. This is her second collar - same brand - the first one lasted 6 years and I only replaced it because it was beginning to fade. It's perfect. We go through a lot of forest and brush. The collar doesn't attract and debris or odors. The durability of this collar is perfect, and I will never use another collar. "Exactly what we were looking for. Very pleased with the collar." Exactly what we were looking for. Very pleased with the collar. "Well made, strong and very flexible." Well made, strong and very flexible. "Awesome collar and the material will make for a long lasting collar which is great!" Awesome collar and the material will make for a long lasting collar which is great! Great collar. Durable, doesn't retain odors, dries quickly and fits well. The sizing assistance on the website is very helpful. "Excellent collar for hunting and everyday use!" I've ordered two of these now. I got one when my lab was a puppy, and now that he's 90lbs, he needed a new one. Excellent collar for hunting and everyday use! "The collar is of excellent quality. " The collar is of excellent quality. Just what I would expect from Gun Dog Supply. On the same day the collar arrived that I ordered, the collar my husband ordered (unbeknownst to me from another company) also arrived. The Gun Dog collar is substantial and fits perfectly. The one my hubby ordered is thinner, of lessor quality, and is actually too tight. So guess which collar my husband's dog is wearing?? Gun Dog's. Thank you! I like the new-to-me pliable collar. Its color seems an even brighter safety orange. I assume it will hold that color longer due to better UV protection, as Gun Dog Supply is thorough in making improvements. Thanks! Amazing strong collar. My dog loves it. Center ring easy for hook up. Received in 3 days after ordering. Best collar I've gotten from Gun Dog Supply yet! Affordable durable and a free name plate. Awesome product! Love this collar. Really well made and quality materials that seem like they'll last. I love this collar. It looks nice on my dog (also that it is close enough to UT colors is great), my dog loves it and I love, love, love the fact that it doesn't smell. We love Gun Dog Supply! The website is awesome and very informational. This is our second Durasoft collar and we love it as much as the first. Well made and durable for our dogs that are active on land and in the pond. Also have a Griffon, and the collars are durable. The best value for the money. Great collar, well constructed with double rivets where it connects to the buckle and brass name plate. Highly recommend. Really surprised by the quality! The size is perfect and solid, excellent stuff! Second order for one of these. My dog finally wore out the first one, but it lasted over 2 years! He is a huge swimmer so this is a great collar that we don't have to worry about him getting wet. Extremely durable, great quality, and looks beautiful on him! I love the brass plate and info. My beagle has been known to travel a bit. We spend a couple of weeks at the lake in Minnesota and she ventures into the neighboring woods, critical to have that info. available. Also like the double ring. We walk in the park every morning and the center ring works great for leash attachment. Great collars in the field and traveling. Great collar, what was advised at a fair price. Durable. Washable. Quality collar and service. Thx! The collar looks & feels great. I have been buying my hats and bennies from Bayside. My jeans at RoundHouse. Both are made in the USA. That is why I bought your products both the brands are made in the USA, also in late season the collars feel great.Buy USA. Arron Tippin sang you got to stand for something or you fall for anything.You also have GREAT customer service and follow up. Take care and God Bless. This is the best! I have used these collars for several years. They stay pliable and look great even after years in the field. I love gun dog supply!! Great collar. Stays supple and doesn't hold orders. Great service and fast shipping from GDS. Love the quality and the price. Ordering another. Great Collar. Free name plate a bonus. Durable, quality, no stink collar. Make sure to measure your dog. Very nice collar. Fits well. Durable. I am very pleased by the quality of the collar. I like the fact that it doesn't hold any moisture which could cause irritation or chafing. Also, I appreciate the service your company has given me. Ordering from your company will be in our dogs future. Thank you. This is my second nylon collar, and I think they're terrific. They don't absorb odors like non-coated nylon collars, they're much easier to clean, and above all they're comfortable to the touch for me and the dog. If I were the manufacturer, the one change I'd make is to eliminate the D ring at the buckle end on all center-ring collars. It's redundant, so always I cut mine off (carefully!) with a hacksaw. Great fit, easy to spot from long distances, and very secure with leash. Having it personalized with her info gives me a sense of security incase she ever runs off. Very easy to read. We love this collar. You don't have to worry about it smelling or fraying. Fits well. Great quality product. Tag end was a little long, so I cut it. Great material and highly visible. Stamped tag means no hanging dog tags. Great product. Made to last, and well worth the money. Real strong collar.1st one lasted over 5 years. Only replaced it because of changed phone # on ID tag. Got new collar with new info tag in 3 days! Excellent collar. Almost over built. Should last a lifetime. A few suggestions, maybe offer a chartreuse color to differentiate two similar dogs running in the field and a different width, 3/4 inch? And a slightly lighter or thinner material for smaller for younger dogs. Overall great collar for my adult GSP. Will be ordering another for my other dog. Highly visible and made of good quality materials. The delivery was quick. I will do business with Gun Dog in the future. Thank you. Looks sharp and is extremely durable. Easy to clean, soft and durable. Just like the description. Product was as described. The name plates are perfect. "Very visible in the field." They are very visible in the field. They are soft but seem very tough. This product is very soft and fits well. I love the professionalism of the brass plate. He looks very handsome in his new collar. The orange goes very well with his dark brown hair. I will be buying all my collars from you from now on. Dr. G loved the gift. Don't know how to top this year, but I bet Gun Dog Supply will have just the thing! Great collar for a very active dog!! Holds up great and doesn't fade even with hours of swimming in the lake and hiking through the woods. The collar stands up to all the elements. We got one for a previous dog. When we got another dog there wasn't any question on which collar to purchase. Great product and wonderful company to buy from. Quick shipping and follow up. Only had it for about a month, super soft, seems like it's comfortable for dogs. I like it better than the plastic ones. As advertised, soft like leather. The color is much brighter than I thought it would be and really stands out in all kinds of cover. Good purchase. As advertised: soft like leather. The color is much brighter than I thought it would be and really stands out in all kinds of cover. Good purchase, I really like the idea of using TWO name plates with every phone number and name I can think of (phone # with name on each line fits)! Nice, clean lettering on name plates. I got a second set to put on my e-collar just in case I drop it or leave it someplace. Good people. Worth every penny. Would recommend it to anybody. Love this collar! He also loves his collar! Durable and good quality, I would recommend for a high energy dog, make sure to add the nameplate. We love this collar. You sure can see our black lab coming with this collar on! This collar was made to last! Great collar. Looks terrific, durable and great visibility for off-leash walks/hikes. This collar is very well made. The color really stands out and is easy to see. It does have a bit of weight to it, but my dog wears it with pride! I definitely would recommend this collar. Excellent collar, all of the collars that my dog has in the past start to smell, this one does not! This collar doesn't irritate his neck and he is very happy and so am I. I would recommend this product to everyone. Exactly what I was looking for. Great quality and just as described. This is an amazing collar. It fits like a charm, comes with the brass nameplate, and the circular ring in the back is an excellent addition as I use this collar in conjunction with a Herm Sprenger training collar. This is the type of collar that will stand up to constant wear and tear. I am very happy with this purchase. Outstanding collar. I can't find a better one as far as I'm concerned. Soft, durable, and easy to clean. Id tags are good quality. Great product. Great product. My dogs wrestle with each other, grabbing their collars and these have withstood all that so far. The engraved collar IDs are great. Thanks so much. Great fit and looks awesome. Having it personalized with our info incase she gets lost, gives a sense of relief. "This is the 8th one I have purchased, and they are great." This is the 8th one I have purchased, and they are great. "Very easy to keep clean, and they stay nice and bright for easy visibility in the field." Great collars. Very easy to keep clean, and they stay nice and bright for easy visibility in the field. I will continue using this collar. "These collars are soft, yet are holding up to lots of extreme outdoor activity." Pointers, but both love the water. These collars are soft, yet are holding up to lots of extreme outdoor activity. "Gun Dog Supply helped with another great product sent in record time." Gun Dog Supply helped with another great product sent in record time. They always have what I need. Prices are always good. "Great heavy duty collar that should last many years of hunting!" English Cream Golden Retriever. Hunts. Family pet. Great heavy duty collar that should last many years of hunting! "Fast Service and Great Product!!" Fast Service and Great Product!! I have spread the word about your company!!!! "I like that this collar has the center ring and an addition ring." Great collar. It fits well, and the engraved plate looks very nice. I like that this collar has the center ring and an addition ring. Other collars with just the O ring turn weird when the dog is leashed. Very satisfied. Will order another! "Like the softness of the collar. Well made overall." Don't know how well the color in the collar will last. Like the softness of the collar. Well made overall. "I hope to purchase another dura soft collar in a different color for our companion dog as well." The collar has met all my expectations. I hope to purchase another dura soft collar in a different color for our companion dog as well. "We like the easy clean material, over that seen in woven materials." The collar is built like a tank. Very essential for peace of mind when an owner depends on security as a priority. We like the easy clean material, over that seen in woven materials. Kudos! "Exactly what I was looking for at a fair price." "So far this collar fits good, looks good, and the texture is nice." So far this collar fits good, looks good, and the texture is nice. However, I cannot attest to the strength...yet. It'll take some time and use with a check cord, leash, and time in the brush and water. It appears to look like it'll hold up well though. As for Gun Dog Supply, I am extremely happy with their customer service, and products. I have purchased a similar product from another similar website... *cough* DogsUnlimited *cough* which took 3.5 weeks to get to my door. Gun Dog Supply had it at my door in just a few days. The price and quality beats the other company's product too. I will buy from Gun Dog Supply again, again, and again. "I have never had a problem with anything I've purchased through Gun Dog Supply!" Red Setter & Pudelpointer. Hunts. Family pet. I have never had a problem with anything I've purchased through Gun Dog Supply! You guys have great products and exceptional service....super way to run a business. "Great collar. My dog works hard, and the last one made it 3 years." Great collar. My dog works hard, and the last one made it 3 years. Just got another, quality is great. "the collars are of good quality"
My order was received quickly, and the collars are of good quality. Quality product. The nameplate is a great addition. This is the second time I have ordered this collar, and I love it!!! My brother and his wife only order their stuff from this site too. Everyone should order from here. Their prices are awesome too. Great quality, and now we won't loose ID tags. "I will never buy another kind"
I will never buy another kind. Great quality. Great product. Expect many years of service. Durable. High visibility. Quality name plate. Easy on the hands, and the dog's neck. Sturdy no-rust hardware. Love it. Very fast delivery. Great product. Will order again. I love the collars. They look nice and clean up well. Love the collar! I have 2 GSPs who love the water, and the collars do not retain any odor. They look great, even after the mud. Great product and awesome customer service! "The Mendota DuraSoft can take the abuse." Our GSP is extremely active. The Mendota DuraSoft can take the abuse. "Just as the description states." Just as the description states. "Waterproof and very visible at all times. Great product." Waterproof and very visible at all times. Great product. "Soft, durable collar. Nice fit. High visibility." Soft, durable collar. Nice fit. High visibility. "Great product and excellent quality"
Puppy has to grow in to it. But great product and excellent quality. "Awesome Collar with the ID brass plate"
Awesome Collar with the ID brass plate. Excellent customer service with exceptional delivery service!! "Even though his neck measured in the middle of this ones range I have to put it on with the last hole or two." Should have gotten a little larger. Even though his neck measured in the middle of this ones range I have to put it on with the last hole or two. Also when I first put it on the last hole is tight but as he walks I then can adjust it tighter one hole. "You won't find a better collar"
"Dirt and mud wipe right off of it. Doesn't hold water. Doesn't smell." Great collar. Nice quality. Dirt and mud wipe right off of it. Doesn't hold water. Doesn't smell. Would recommend getting this collar. "Collar is soft, durable, and bright orange." Collar is soft, durable, and bright orange (live in the woods), so with the hunting season much safer for her. Excellent collar. "I get so many compliments on it. They do not have an odor and they have not faded." English Springer Spaniels. Family pet. I love this collar. I get so many compliments on it. They do not have an odor and they have not faded. I would rebuy them for both of the dogs! "Great quality and appears very durable." Great quality and appears very durable. Colorfast (was a problem with other orange colors on black dog) and very visible. Will order again. "Exactly what I wanted!! Love the nameplate attached right on the collar!" Exactly what I wanted!! Love the nameplate attached right on the collar! "Easy to clean with just hot water! Held up nicely." Easy to clean with just hot water! Held up nicely. I'll be buying these every time I need new ones. The price is nice too!!!! "Very durable and very bright. Best collar I've ever used!" Only bought another one because the dog outgrew the first. Very durable and very bright. Best collar I've ever used! "Like the center O-ring for ease of hooking him up." Holds up well; Like the center O-ring for ease of hooking him up. Good color selection. "After going to the dog park and seeing all the black labs with red collars, we had to get something that stood out." We love the collar. The orange stands out great at dusk against our black lab. After going to the dog park and seeing all the black labs with red collars, we had to get something that stood out. 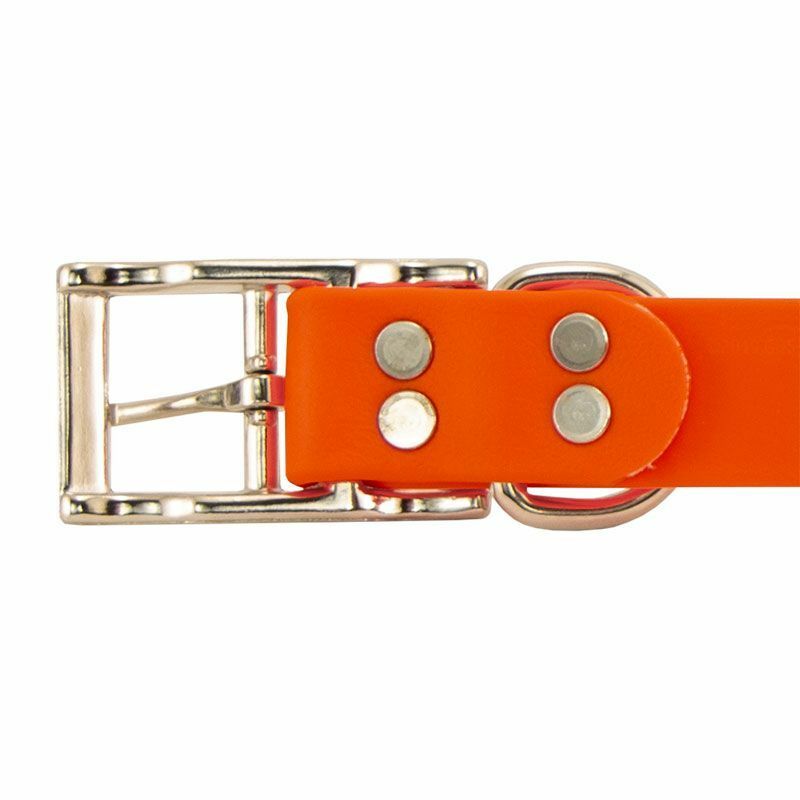 The collar is great material and the orange really does the job. We are ordering more of these collars for the rest of our pack. "Wider choice of colors and the same great collar technology"
Mixes - Heeler,Hounds,Basset,Eskimo. Family pet. We love the collars. We got an orange Medota for our lab, then added an array of colors for the rest of the pack. The K-9 Komfort Tufflex gives us a wider choice of colors and the same great collar technology. We are just waiting for our last ones to come in. Thank you for such a great product. "Fantastic collar! Durable and bright; does not discolor or absorb odors." Fantastic collar! Durable and bright; does not discolor or absorb odors. Getting another one only because my pup needs the next size. So far so good. Been wet and no dog odor. "More durable than nylon web collar, and more visible"
More durable than nylon web collar, and more visible when he's out helping to gather the livestock. "I really like that it has a D-ring." Nice collar, fair price. I really like that it has a D-ring. "Nice and soft, and it love the bright color." Nice and soft, and it love the bright color, I can spot my dog easily. "Stays clean and doesn't retain moisture. Looks good too." Awesome collar. Fabric is excellent. Stays clean and doesn't retain moisture. Looks good too. Great value. We've had other similar collars before, but the others were from a different place, and were plastic coated, stiff, and eventually cracked & pinched. This one is not coated, it's smooth and very flexible! "It doesn't have that plastic look or feel at all. It looks great on my Black Lab." This collar is more than I expected. I expected a shiny hard plastic collar. This collar is not shiny. It doesn't have that plastic look or feel at all. It looks great on my Black Lab. As far as the center ring, I only buy center ring collars. Its in position all the time. You don't need to search for a ring to attach your lead. 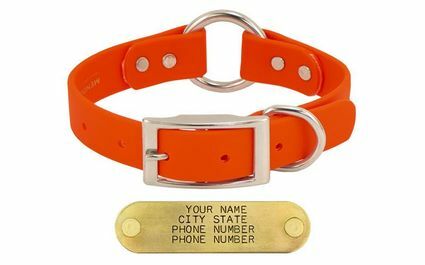 "The collar is very durable, easy to clean and the name plate is attached very securely." Very pleased with the product and the name plate. The collar is very durable, easy to clean and the name plate is attached very securely. "Previously, our dogs proceeded to scratch and pull each other's collar off and chew. This time they have not offered to try to get rid of the collars." Have 1 border collie and 1 setter. We love the collar. Previously, our dogs proceeded to scratch and pull each other's collar off and chew. This time they have not offered to try to get rid of the collars. Thank you. "Strong, long lasting, and the name tag is a great option." These collars are strong, long lasting, and the name tag is a great option. "Excellent quality, bright and easy to see in the woods"
Excellent quality, bright and easy to see in the woods, and a great id plate. "So far the collar is great. The value is the best!" So far the collar is great. The value is the best!! That was the reason I bought it. Now I get to see how it holds up, and so far so good!!!! "Collars fit well on both dogs, and just as promised, collars don't hold odor. Great product. Great price." Collars fit well on both dogs, and just as promised, collars don't hold odor. Great product. Great price. Will definitely use Gun Dog Supply again. "Just what I was looking for. 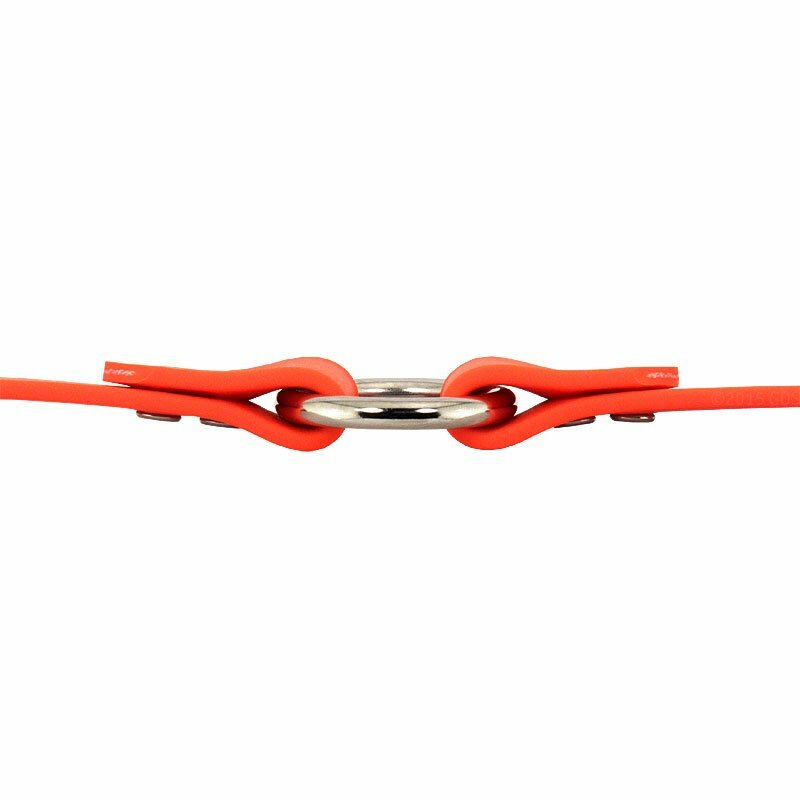 An odorless, flexible, hunter orange collar." This was just what I was looking for. 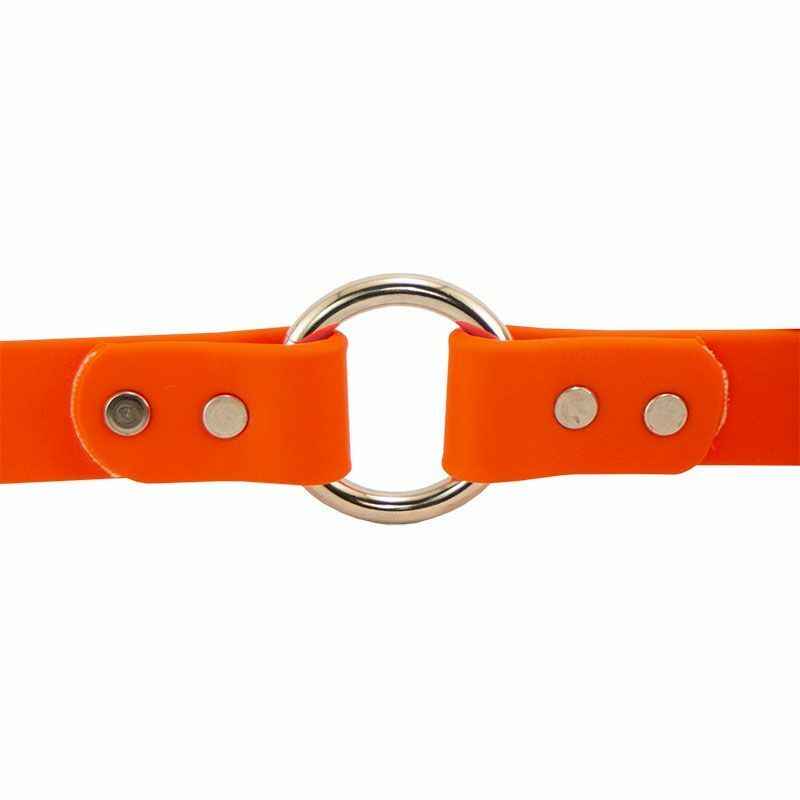 An odorless, flexible, hunter orange collar. Good material and excellent quality. "It's a perfect fit for my pup." I am very happy with this collar. It's a perfect fit for my pup. Gun dog supply is a great site . "It is the best collar I have bought yet, and the brass name plate is excellent!" Excellent collar! It is the best collar I have bought yet, and the brass name plate is excellent! "Great collar and outstanding brass name plate. I have ordered from Gun Dog Supply on numerous occasions, and they have always exceeded my expectations!" Great collar and outstanding brass name plate. I have ordered from Gun Dog Supply on numerous occasions, and they have always exceeded my expectations! Great knowledgeable staff, if you have questions about any products! "This is a great collar so far. I feel it will last and work out great for my situation. Customer service was also excellent." This is a great collar so far. She has only wore it a couple of times because she is an inside dog and listens very well when we go out, so I usually don't collar or leash her. I do like the material and hardware. I feel it will last and work out great for my situation. Customer service was also excellent. Thanks Gun Dog Supply. "It's all he ever wears." It's all he ever wears. "Great collar. Holds up well, and easy to clean." Great collar. Holds up well, and easy to clean. Really like the brass I.D. tag. Would recommend this to anyone. "Great product, great service, and great company." Great product, great service, and great company. "I was impressed with how fast the shipping was." I was impressed with how fast the shipping was. I'll order from you guys again. "Great quality and fast shipping." "Good quality, easy to clean, and doesn't retain any odor after my dog rolls in the most foul smelling matter. " Good quality, easy to clean, and doesn't retain any odor after my dog rolls in the most foul smelling matter. The collar replaced a nylon webbed collar for this very reason. Great collar. Gonna withstand years of abuse. "Great durable collar that doesn't absorb water"
Great durable collar that doesn't absorb water, yet is soft and pliable. Awesome product. Easy to clean after hard hunt. britt german sh lab. Hunts. Work great. Love the name tags. "Looks like a really good product." Service was great. Looks like a really good product. "The material the collar is made of is both supple and durable." The material the collar is made of is both supple and durable. I look forward to giving it a true test this summer when Max spends lots of time in Lake Michigan. "A very well made item." A very well made item. The first collar that has lasted. The name tag is a nice touch. "Can't find anything like it local and would definitely order from here again!" My dog is a pet, but loses his tags all the time and wrecks his collars. This collar is heavy duty and no more tags! Can't find anything like it local and would definitely order from here again! Totally worth the shipping costs to Canada! "For the price with the custom name tag that doesn't hang down, you can't beat it." For the price with the custom name tag that doesn't hang down, you can't beat it. Great collar! I can locate my dog with the bright orange easier in the bushes and trees. Easy to clean and don't have to worry about it getting wet. Love the sturdy hardware and the icing on the cake is the great riveted name plate. Easy to read and don't have to worry about losing it. Price is great too. "This collar fits my dog just right." This collar fits my dog just right. The free tag is nice and very easy to read which is exactly what I was hoping for! Excellent collar, soft and durable. Speedy transaction and fast delivery. german wirehaired pointer. Hunts. Family pet. Competes. Great collar so far. Seems to be durable. I like the collar. I can only hope Homer does. "Looks beautiful and fits great!" Looks beautiful and fits great! I love that the nameplate is riveted in, so it won't fall off or snag in the bush! The orange is bright and very visible from a distance. The collar has been wet several times and it does not bleed. The price was reasonable and the shipping was fast! Great collar. Looks good on him. Thanks. "It's a perfect collar for a perfect dog." It's a perfect collar for a perfect dog. Great collar. Easy when leashing. "This is my second Mendota DuraSoft collar." This is my second Mendota DuraSoft collar. I purchase them because I love the center ring, and it also has a great I.D. tag. My first one got a little stiff with wear, and I've replaced it, but it is still functional. Love them. They are so durable, and the brass name plate is perfect. "I'm really impressed with your products and service." You guys are a real class act. I ordered the wrong size collar and when I returned it you replaced it with the correct size very quickly with no hassle. I'm really impressed with your products and service. Thanks Steve. Love this collar!! I ordered it with the name plate. My German Shorthair Pointer looks great in it. We perform freestyle disc, and he really stands out in this collar. "Very visible, flexible, and durable." Eng setter golden ret. Hunts. Very visible, flexible, and durable. Satisfies my needs very well. "a friend of mine liked them so well, I ordered one for him"
I bought two, and a friend of mine liked them so well, I ordered one for him. "It's the only collar that I buy!!" It's the only collar that I buy!! I've been hunting and training labs since 1977. They're very durable. I like them because they stand out. We run 25 dogs in our club. I have no problem spotting my dogs from a distance. Also my tracking collars are orange. "Like the collar. Was everything I expected." Like the collar. Was everything I expected. I rated it with five stars and would recommend anyone needing a collar or other hunting or pet supplies to check out Gun Dog Supply. High quality product! Reasonable price than Cabelas store. We are happy with our buy. Excellent service! They knew I wanted the collars within a week and sent them 2nd day, so I would get them in time for opening weekend of pheasant hunting. Everyone I spoke with had amazing customer service!! "I really like these collars." I really like these collars. Great collar. Great quality. Made of quality material. Cutest dog ever. Family pet. "I only buy collars from you guys." I only buy collars from you guys. "Very nice quality collars with great nameplates." Very nice quality collars with great nameplates. Thank you for the fast, friendly service! Great quality. These collars are a great value. "Great collar at a great price. Very visible." Great collar at a great price. Very visible. "I love the ID tags." Durable, functional, and look good on the dogs. I love the ID tags. Collars last about 7 years before fading and showing wear. "Waterproof, easy to clean, and holds up to briars and brush." Waterproof, easy to clean, and holds up to briars and brush. Customer service was perfect as always. Great collar more than I expected for the price. "Great service and great quality product!" Great service and great quality product! Very impressed. "No better place out there than Gun Dog Supply!!!" No better place out there than Gun Dog Supply!!! Good solid collar. Good visibility for hunting dogs. "Fits perfect, good material, and especially love center ring." Fits perfect, good material, and especially love center ring. "Ordered one from Cabela's. It was way cheap. Gun Dog is so much nicer." Ordered one from Cabela's. It was way cheap. Gun Dog is so much nicer. "Easy to clean, and doesn't hold odor like leather." Collar's holding up well. Easy to clean, and doesn't hold odor like leather. "Good, bright color, and it's durable." Good, bright color, and it's durable. "Other than being a little heavy, the collar looks to be of great quality and very durable." Other than being a little heavy, the collar looks to be of great quality and very durable. I added a contact plate to the collar. It has worked out very well. "Sometimes tail slips out of ring but other than that it is a great collar." Sometimes tail slips out of ring but other than that it is a great collar. Hasn't come off and the name plate is very nice. Just what i wanted in a collar. "Disappointed that after only 2 weeks of wear, one of the rivets has already lost it's backing." Disappointed that after only 2 weeks of wear, one of the rivets has already lost it's backing. It would cost more than the cost of the collar to pay shipping costs both ways for a replacement. Otherwise collar washes easily, like the 2 different options for attaching leash and name plate makes it so there are no more clinking dog tags. "Like how durable the collar is, only problem with the collar is, due to the texture of the collar it holds dirt but does clean off with some soap and brush." Like how durable the collar is, only problem with the collar is, due to the texture of the collar it holds dirt but does clean off with some soap and brush. "PROBLEM on size...purchased smallest size and still to large for beagle dog..can't tighten up because identfication tag in way." PROBLEM on size...purchased smallest size and still to large for beagle dog..can't tighten up because identfication tag in way. "This collar is a great value and is well made." This collar is a great value and is well made. Shipping was a bit high. "Sportdog light does not fit on the collar." Sportdog light does not fit on the collar. "These collars seem to be good quality"
These collars seem to be good quality, but they are A LOT heavier than what I was excepting. I ordered them in the smaller sizes for my puppies. I think they are a little too heavy for a puppy, but would be fine for a grown dog. "I followed the instructions for measuring, and he was 16 inches. The description said that the collars were 2 inches on either side, so I ordered an 18 inch to allow for a bell. Absolutely too huge on him." I followed the instructions for measuring, and he was 16 inches. The description said that the collars were 2 inches on either side, so I ordered an 18 inch to allow for a bell. Absolutely too huge on him. Though I bought the smallest collar there is they are still two big for my dogs. The metal is just to heavy. They need something more petite. This could have been my fault and just didn't read the description accurately. I love the fact this collar is USA MADE, NOT China made crap. And there is minor tear after I received the package. For those of you who prefer the look and soft feel of leather but worry about water and odor absorption, this collar is the answer! 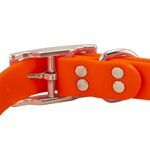 These collars have superior strength and durability, high resistance to fading, moisture and odor absorption. They have an embossed surface for a very elegant look and are soft to the touch and provide a very comfortable grip. Your dog will appreciate the soft texture as well. 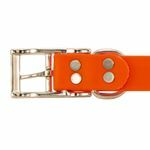 The collars are constructed with spread rivets and nickel-plated hardware. These collars are made with a conway buckle, center-ring "safety" ring, and dee ring. Made in the USA.